Archangels Salvation is a NetEnt Software based video slot game of 6 reels and 100 paylines. Total coins for this slot game is 40, while you can play this slot game using your desktop or mobile phone for 40p per spin £€200 per spin. Archangels: Salvation is one of the best virtual video slots that NetEnt software has these days. You will see angels on the left side of the game and demons on the right side of the reels and a great fight among them to retain things. It is a game based on the battle field of good and bat and it is up to you that which side you are taking. This is the first NetEnt slot game that has 100 paylines. This slot offers a jackpot of 150 times of your total bet. There are 3 bonus rounds in this game where you could get 10 to 25 free spins and up to 10x of multiplier on your total bet. The reels of the game includes symbols such as hearts, diamonds, spades and clubs, lions, hoods and helmets as well as many other exciting symbols. The symbol latter 2 is the most paying symbol in this game. It will offer you 150 coins on your total bet if you land latter 2 on 5 on a payline. Return of player percentage for this slot is over 96%. You can check out options/buttons of the game i.e. ‘Coin Value +/-‘ which can be used to Set the coin denominations, “Bet max’ option can be used when you want to play with the highest bet possible,” Level +/-“ is there for you when you required to play the game and it sets the number of coins per line, ‘spin” option will start the reels in motion and “auto Play option will let you play the game for a chosen number of times without any middle interference. 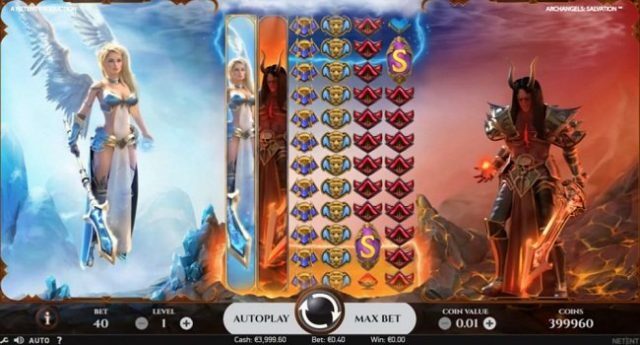 Archangels Salvation slot features great design, amazing graphics and an interesting game play. Play this slot at any NetEnt Casinos for real money. The game contains 2×2 wild symbols. The wild (W Lion) can replace/substitute all other symbols except the scatter. The first Bonus mode is the Wild (Heaven):– Archangels slot has 2 Hot Spot areas. The first hot spot area in this slot is the top 2 rows, whereas the second hot spot area is the bottom 2 rows. As mentioned, there are 2×2 wilds each area triggers. The first one is ‘Heaven’ feature. This feature gets activated when 2×2 wilds land fully. It means a total of 4 wilds (2 sets0 will be created. Wild (Hell):- This is another feature in this slot machine. Free spin Bonus feature:- if you land 3 scatter symbols on payline then you will receive 10 free spins, 4 Scatters awards 15 free spins, 5 scatters awards 20 free spins and 6 scatter symbols will award you a total of 25 free spins. You can win up to 3,500x of your total stake of your single free spin.